This month we had to say goodbye to a very valuable member of our team, Dhurba Sharma. Dhurba has been working at Umbrella for over 4 years and has been thoroughly dedicated and compassionate since joining. He began work as a science tutor but Umbrella Management quickly observed both his academic potential and his natural caring attitude with the kids. 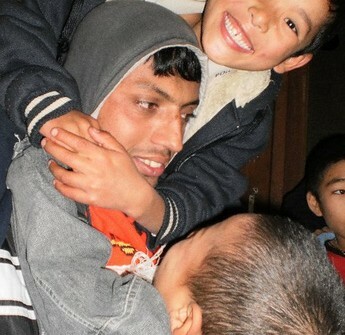 His care for the kids was seen when he became the monitor for a smaller home that Umbrella was assisting, CVO Nepal. He showed true empathy in his role and went above and beyond his responsibilities, he was then the obvious choice to become House Parent for those children when they were brought under the care of Umbrella, and he kept this role for the past 2 years. Beside this Dhurbas work on the office side of the organisation was also pivotal to all we have accomplished here in the past few years. After working as a science tutor he was promoted to head of the tutor programme. Dhurba was then promoted to Education Coordinator and finally to Youth Programme Coordinator. Dhurba played an instrumental role in setting up the Next Steps Youth Programme. His research and administration skills have made the programme what it is today. He also showed exceptional depth of character when dealing with the issues of the youths entering the programme. On behalf of management, staff, children and all of us in the Umbrella family around the world I would like to thank Dhurba for all his efforts and wish him the very best of luck for his future endeavours.